While looking through my archives I found a dolls word search that I forgot I had done! This word search is perfect for fans of American Girl dolls as it features all of the characters from the popular book series and doll line. This makes a nice activity for Girl Scout Troops, Birthday Parties, Kids Book Clubs and more! 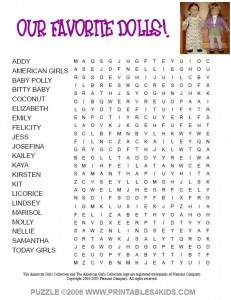 Click on the image above to view and print the dolls word search full size or download Our Favorite Dolls Word Search as a PDF file. Do you have a doll fan in the house? If so, check out our sister site, Doll Diaries, for pictures, news, product reviews, coupons and more. There are more American Girl activities on this site – American Girl word scrambles and printable scrapbook ideas from American Girl. I loved all the neat stuff you have for American Girl. I am a doll collector and I love those dolls. You have a wonderful website and I enjoy visiting this one and others that have to do with dolls.